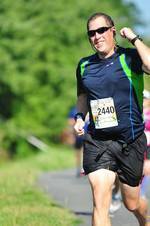 "A Challenging 20K in the summer"
I've run the Leesburg 20K for the past two years and it was actually the first race I ever signed up for after getting back into running. Packet pickup is at Potomac River Running located off Route 7 and easy process. It allows you to pick up some additional gels/nutrition if you need some last minute supplies or other running items. The course starts/ends right across from Tuscarora Mill on Harrison St SE in downtown Leesburg. There is a town parking garage right across from the start/finish, however beware it does fill up quickly. Otherwise you can find free parking on the street in downtown Leesburg. The starting corral is semi-organized with placards listing anticipated paces however it is basically scouts honor that you line up in the correct area of the corral. Both years I've run it I've had to navigate around people who lined up further up than they should have running at slower paces at the start. The course starts off on surface streets through Leesburg heading to Loudoun County High School. After doing a loop around the high school the 20k veers on to the W&OD trail heading towards Purcellville. The W&OD isn't closed during the race so you will have to be aware of cyclists, however the race organizers do their best to keep everyone safe. The section on the W&OD trail is about 9-10 miles, an out & back, which can be brutal if you aren't careful. If you look at the elevation profile the first half of this race is all uphill. It isn't a crazy incline, and in fact most of it doesn't even look uphill visually, but the fact it is all uphill the first half can really wear you out if you don't properly pace yourself. The 20K has 6 water stations throughout, with 4 of them also having gatorade for you. There is also one gel stop at mile 6 of the 20K. There is a 3 hour time limit for the course (~ 14:30 pace). While I enjoy this race and do it yearly, the fact the majority of it is on the W&OD means there aren't many spectators to cheer you on. 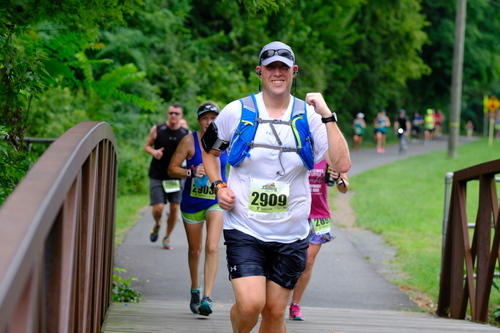 You have to have the mental toughness to continue until you get near mile 12 when you get back near downtown Leesburg and there are sporadic spectators along the trail and streets to the finish line.